On Monday afternoon, former U.S. 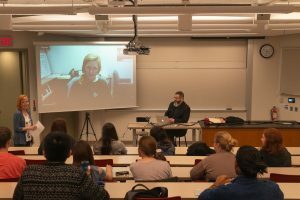 Ambassador to the United Nations (UN) Samantha Power met with students via Skype to discuss her work, her present perspective on diplomacy, and the state of human rights around the world. After serving as the U.S. Ambassador to the UN during President Barack Obama’s second term, Power returned to Harvard University – where she is currently the Anna Lindh Professor of the Practice at Harvard Kennedy School and Professor of Practice at Harvard Law School. Chair of the human rights and humanitarianism concentration Wendy Weber facilitated the event with help from the Amy Ostermeier Human Rights Educational Fund, established by friends and family of Amy Ostermeier ’98 to honor her life and work in human rights. Ostermeier and Power were friends when they worked at the U.S. State Department together, and Ostermeier’s family reached out to Weber about having Power speak to Macalester students. During the call, Power examined the human rights abuses of both western and eastern countries. Former United Nations Ambassador Samantha Power discusses her work with students via Skype. Photo by Long Nguyen ‘21. Power also touched on the importance of maintaining hope for democracy. “There is this view that somehow democratization is dangerous [and that] feeds this culture of despair around democratization and human rights,” Power said. “It fuels human rights abuses, where people are brutally victimized, but then it also fuels probably what some of you feel, which is a sense of a democratic recession. A sense that things aren’t trending that well globally. “This is a bit of doom loop because if you don’t believe that the system is resilient or that democracy can be saved or revitalized, then the temptation to give up on democracy is very real,” she continued. 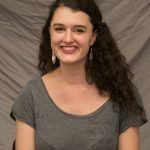 Emma Verges ’21, also at the event, became interested after attending a Sunday night screening of “The Final Year,” a movie that follows Mr. Obama and his foreign policy team during their final year in the White House. Verges found the event compelling for its feminist perspective. In the end, Power strongly advocated doing the work – with people, day in and day out, to advance the causes of equality and freedom.